My mother passed this recipe to me many years ago. It is the richest cheesecake that you can make. I save it for special occasions when I want to share a show stopping dessert that tops off a dinner or a party. I have included a recipe for a pineapple glaze, or you can thickly spread sour cream on top. Or if you want to make this for Christmas as I did this year I put candied cranberries on top. 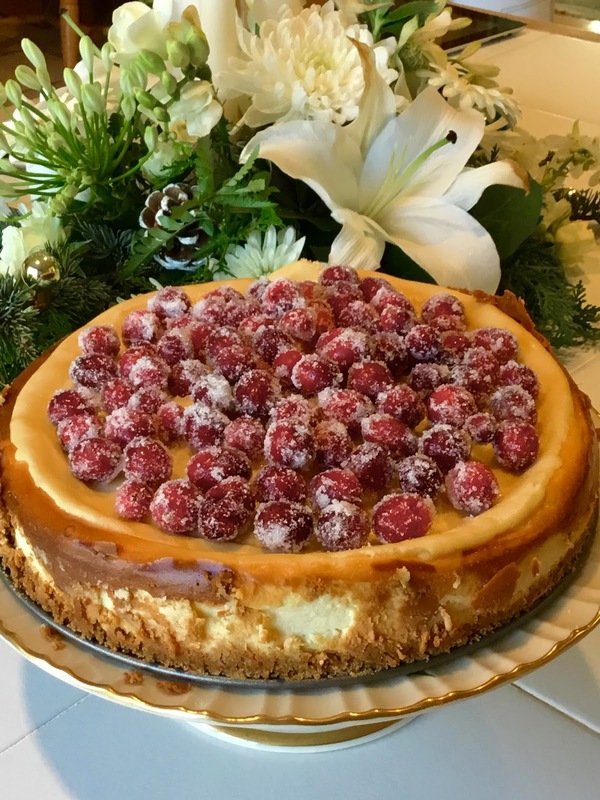 Ether way this cheesecake is the star of the show! Preheat over to 400F. Grease the inside of 9-inch springform pan(3 inches high). Remove side. Make crust: In a medium bowl, combine flour, sugar, lemon, peel, vanilla. Make well in center; with fork, blend in yolk and butter. Mix with fingertips until smooth. Form half of dough into a ball and place on bottom of springform pan. Place wax paper on top; roll pastry to edge of pan. Remove paper. Bake 6 to ;8 minutes or until golden. Cool. Meanwhile divide rest of dough into three parts. Between waxed paper roll each part 2 1/4 inch wide and 9 inch long. Assemble springform pan with the crust on the bottom. Line sides fo the pan with pastry strips, over lapping ends. Remove waxed paper. Preheat oven 450F. Filling: In large mixer bowl, blend cheese, sugar, flour, peels and vanilla at high speed. Beat in eggs and yolks, one at a time: beat until smooth, occasionally scraping bowl with spatula. Beat in cream. Pour into pan. Bake 10 minutes. Lower oven to 250F. Bake 1 hour longer. Remove pan to rack to cool, 2 hours. Make glaze. Glaze: In small saucepan, combine sugar and cornstarch. Stir in remaining ingredients. Over medium heat, bring to boiling, stirring; boil 1 minute, or until thickened and translucent. Cool. Spread surface of cheese cake with glaze; refrigerate for 3 hours or overnight. Sugared Cranberries: Bring 1 cup sugar and water to a simmer in a saucepan. Simmer until sugar is completely dissolved. Pour simple syrup into a heatproof bowl and allow to cool for about 10 minutes. Add cranberries and stir to coat. Refrigerate cranberries in syrup overnight, stirred a couple times to coat with syrup. Remove cranberries from syrup and roll in remaining 1/2 cup of sugar. You’ll need to roll them a few times to get a couple layers of sugar on them. Set cranberries aside to dry for a hour or so.